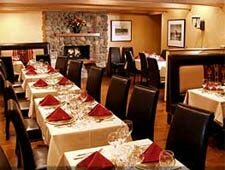 Historic steakhouse serving "high desert cuisine" in a casual setting in Sedona's art district. : You don't need to wear boots or a Stetson, but if you do, you might feel like a true cowboy and blend in with the staff. This casual southwestern steakhouse serving creative “high desert cuisine” is located in one of Sedona's oldest buildings, which prides itself on being the birthplace of the prestigious Cowboy Artists of America. (And you can see the second largest set of Longhorn horns in the U.S. there, too.) The menu features regional dishes such as cactus fries in a prickly pear sauce, rattlesnake brochette with raspberry-plum sauce atop cilantro flatbread, and choice cuts of buffalo sirloin and baby-back ribs. Lunch offers the usual burgers and pulled-pork sandwiches --- but they feel gourmet. This is a family-friendly joint, complete with a children's menu, and long waits are usually the norm on weekends.